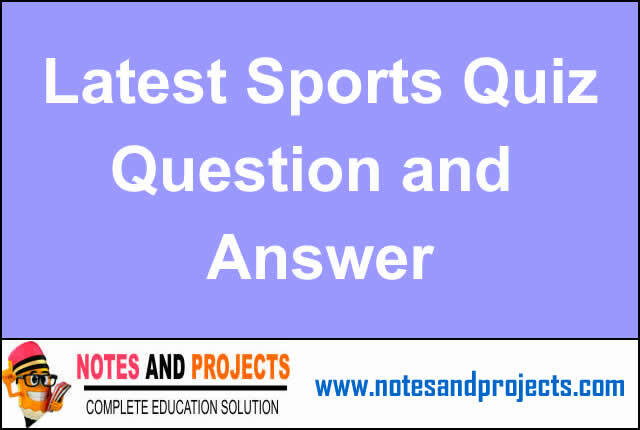 Hello Friends, In this post we are giving you questions on sports and games with answers that is very useful for GK. So If you are preparing for any competitive exams Like IAS, PCS, UPSC, Banks and Railways or any other exam for government jobs then these gk questions on sports with answers is very good for you. I am not giving PDF of this sports gk questions 2018 purposely so just write these lines on a paper and paste it on wall near your study table and try to read 3 to 4 time in a day when you are free. It just takes 2 – 3 minute only. ● Venue of Asian Games 2022 – Hangzhou, China. ● Venue of Asian Games 2026 – Nagoya, Japan. ● Venue of CWG Games 2010 – New Delhi, India. ● Venue of CWG Games 2014 – Glasgow, Scotland. ● President of ICC – Zaheer Abbas. ● Chairman of ICC – Shashank Manohar. ● CEO – David Richardson. ● Venue of ICC Cricket World Cup 2023 – India. defeating Pakistan in the final. ● Venue of World Cup 2014 – Bangladesh. ● Venue of World Cup T20 2016– India. ● Venue of World Cup 2020 – Australia. The first Women’s World Cup was held in England in 1973, two years before the inaugural men’s tournament. England won the title by defeating Australia in the final. Australia has been the most successful team in the Women’s World Cup, with 6 titles and 3 runners up. England won the Women’s World Cup in 2017 by defeating India in the final. defeating New Zealand in the final. ● President of IHF – Narinder Batra. (FIFA) headquarter – Zurich, Switzerland. ● President of FIFA – Gianni Infantino. ● Venue of FIFA World Cup 2014 – Brazil. ● Venue of FIFA World Cup 2018 – Russia. ● Venue of FIFA World Cup 2022 – Qatar. ● Venue of FIFA World Cup 2015 – Canada. ● Venue of FIFA World Cup 2019 – France. ● Venue of FIFA (U-17) World Cup 2015 – Chile.